Show your patients you value their time, while we help you and your team optimise your appointments and treatment outcomes. Dental Monitoring helps your patients take photos as the interval you set. Photos are automatically sorted, cropped, organised by date and angulation, and stored. You can access them at any time, from any device. Dental Monitoring helps your patients take regular photos. At any point during treatment, you can view photos from different angles and compare with past images. The DM Artificial Intelligence automatically detects clinical situations from the photos and notifies you of changing conditions as they occur. Access a full range of information: compare the molar and cuspid A/P relationship over time, changes in the overbite and overjet, as often as needed. Our photo viewer lets you remotely assess the situation and its evolution, from a variety of views: frontal, occlusal or buccal. Your protocols send the right instruction to the right people at the right time, so you can eliminate repetitive instructions and solve issues before they become problems. For each protocol, choose from over 170 clinical situations to monitor. DM Artificial Intelligence will automatically detect them from the photos sent by your patients and notify you, at your chosen priority level. You can create your own protocols, or use templates created by our most experienced users. Each protocol outlines how you want your patients and staff to react to the information detected in patient photos. Design each protocol to detect specific treatment situations and react to them the way you would. Your DM messages are triggered when specific patients meet the pre-defined clinical criteria you set, so that your team and patients receive the feedback and guidance they need. The Activity Graph shows the average tooth movement in each arch to give you a quick overview of how active the appliance is at any stage in treatment. The steeper the curve, the more the teeth are moving. Select any particular tooth to see it is moving and when – in translation, torque, rotation and angulation. One line for each arch. In this case the mandibular arch is almost passive – detect the ideal time to change your archwire or make adjustments. During retention, determine if teeth are moving and relapse is occurring. Maintain consistent contact between practice appointments. With our app on iOS and Android, patients can capture their treatment progress, communicate them to you, and receive your instructions. Thanks to automated or live messaging, you control your patient’s treatment remotely and guide them through all stages of their progress. Your patients see their progress and keep your messages with them in their companion app. How do patients download the DM app? The DM app is prescribed by an orthodontist for patients who are in, or about to begin orthodontic treatment. They can download the DM app from the App Store or Google Play. To remotely monitor a patient’s treatment, the orthodontic practice needs to set up a Dental Monitoring account before the patient app can be activated. How do patients take a DM scan with their smartphone? This link shows how to take DM scans. The process takes less than two minutes and is done on the schedule determined by the orthodontist, usually weekly. How do I monitor my patients’ progress using DM? After DM sets up your web-based dashboard, you log in from any web-connected device to review your patient’s treatment progress. This includes sequential patient photos from different views; notifications of what is detected by DM’s proprietary A.I. software; and automated patient communications sent through the DM app. DM employs a clinical team of orthodontists to ensure that our A.I. is validated for quality assurance and accuracy. How do I get started with Dental Monitoring? Each practice creates their own internal DM protocols with the help of Dental Monitoring Product Specialists. Dental Monitoring suggests the orthodontist appoints team members to be trained on how to use the DM dashboard. Each practice can then decide how the remote information (notifications) is processed. Important clinical matters are typically addressed by the orthodontist while others are reviewed by clinical team member. Each notification is color-coded based upon your designated priority. How does Dental Monitoring protect patient data? All patient data is stored on secure web-servers that have been accredited for health data storage. DM Live is a a personalised system to automatically deliver messages to patients and instructions to the practice team. The messages and instructions are customised by the orthodontist and triggered by specific clinical situations. These are detected by DM’s A.I. software from the latest set of patient photos. The orthodontist sets up their own monitoring protocol, such as an aligner protocol for adults or a braces protocol for teenagers. What messages are sent to patients? 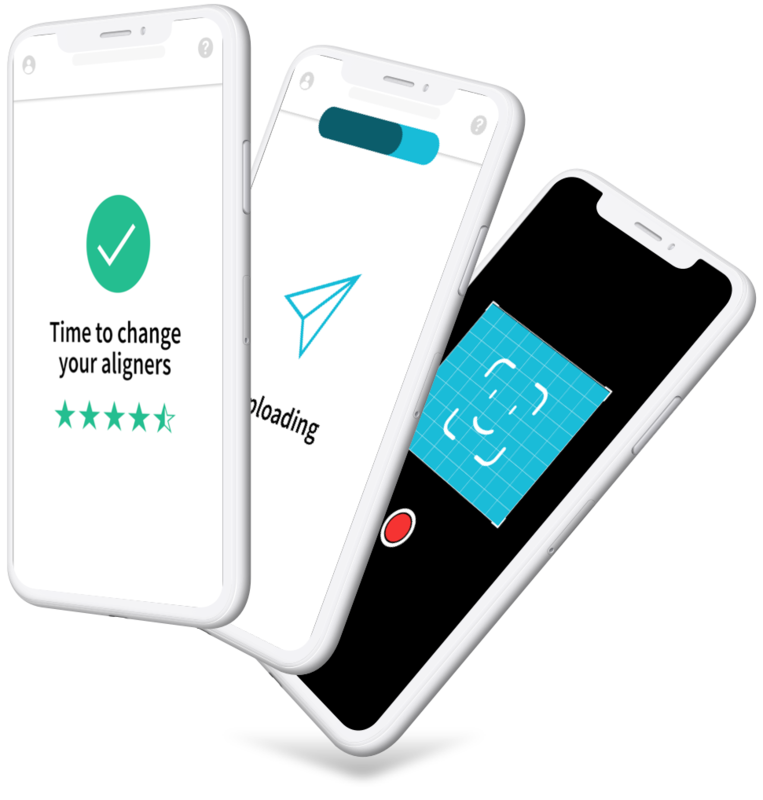 The orthodontist determines the wording of each message based upon any clinical notifications that DM detects from the patient smartphone scans. For example, if deteriorating oral hygiene is detected, the message to the patient may be to improve or brush more frequently after eating. If DM detects that an aligner is not fitting properly then the message could be for the patient to continue wearing the current aligner and use their chewies. Find out how DM can transform your practice.